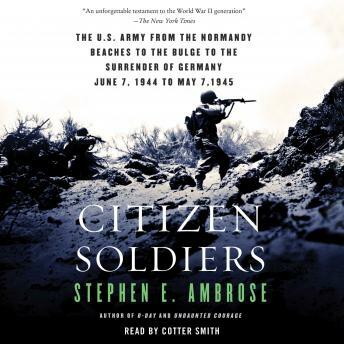 Citizen Soldiers opens on June 7, 1944, on the Normandy beaches, and ends on May 7, 1945. From the high command (including Eisenhower, Bradley, and Patton) on down to the enlisted men, Stephen E. Ambrose draws on hundreds of interviews and oral histories from men on both sides who were there. He recreates the experiences of the individuals who fought the battles, the women who served, and the Germans who fought against us. Ambrose reveals the learning process of a great army -- how to cross rivers, how to fight in snow or hedgerows, how to fight in cities, how to coordinate air and ground campaigns, how to fight in winter and on the defensive, how citizens become soldiers in the best army in the world -- all from the point of view of the men. Just another Ambrose masterpiece ! Loved this book. One of the authors best! If you enjoyed Band of Brothers, you will like this one too. Very enjoyable and enlightening. Great history lesson as to the sacrifices made during WW II. Another epic story told by the soldiers who fought in Europe after Normandy. This book is more of a history book with somewhat less in the way of personal stories. The book is unable to focus on a small group of soldiers, which makes it a little less personal than some of his other works. Ambrose is much more critical of the military intelligence, which at times is a distraction to what the people on the front were doing to win the war. For me this audio book was a very powerful listen. The way that the lives of the men played into the historic events made it all seem so more real instead of something you learn about at school or that Grandpa talks about.